Dusts sweeping in from Middle Eastern deserts may be changing the timing and distribution of rainfall of the Southeast Asian monsoons, according to a recent study by NASA scientists. Monsoons are changes in wind direction that bring alternatively wet and dry seasons to, in this case, India and other parts of Southeast Asia. The rains that come with the monsoons are critical to sustaining the crops and human and animal populations in the region. Typically, aerosols—fine particles in the air like dust and black carbon from burning fuel—are not thought to play a roll in the formation of monsoon rains because they settle beneath cloud layers and the rains wash them out of the air. 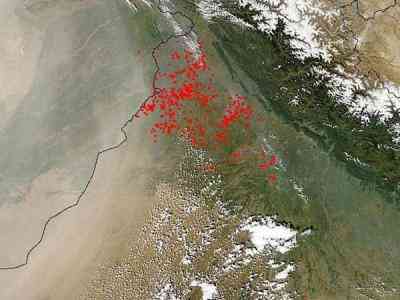 But according to the results of a model study run by researcher William Lau at NASA’s Goddard Space Flight Center, these aerosols may be piling up higher against the Himalayas—and in larger concentrations than previously thought. In such large quantities at the cloud-forming layer, these aerosols could jump-start the monsoon rain formation process, bringing the rains earlier in the season and shifting them closer to the Himalayas. Based on his results, Lau thinks the aerosols may “pre-condition the atmosphere [above] the monsoon.” According to his model, the aerosols absorb solar radiation, and then like most heated objects (think of holding your hand next to a hot pan), they radiate heat out into the surrounding air. This hot air rises, then cools as it does so, causing clouds and then rain to form in a concentrated area—potentially bringing drought to populations relying on the rains. Lau counters that the aerosol concentrations have “huge year-to-year variations” that can affect the monsoons. He concedes that the heat from the aerosols may not always influence monsoon behavior because the processes controlling monsoon formation are so complicated. But he points out that dust could be an important factor when other factors, like temperature differences between land and sea, are dampened. If it is, and his model is correct, it could help scientists make more accurate predictions about when monsoon season willl start and where it is most likely to rain. But Lau is the first to admit that models are idealized representations, and that there are few observations to confirm the model results. Lau and other scientists are beginning to take observations in the Himalayas to see if the aerosols are distributed as “high and deep” as the model predicts–so far what they’re seeing is backing up the model.